Arthritis can affect any of the joints of the wrist and fingers, particularly the base of the thumb and the terminal joint of the finger (distal interphalangeal). Osteoarthritis or ‘wear and tear athritis’ often affects these joints. Osteoarthritis is loss of the smooth cartilage surface covering the ends of the bones in the joints. The cartilage surface becomes rough, and this causes pain with movement, there are often clicks or a grating sound (crepitus) Osteoarthritis usually appears after the age of fifty and there is frequently a family history. The affected joint will become painful and swollen with stiffness and reduced function. Small bony lumps may appear on the back of the joint (osteophytes). Often in osteoarthritis the joints have very little pain and even if they become lumpy and bent, hands function usually remains good. One of the features of osteoarthritis is that episodes of pain, redness and swelling occur and then settle on their own over a few weeks. This helped by avoiding painful activities, simple painkillers, soothing gels or anti- inflammatory medication (people with peptic indigestion may not tolerate these medicines). Splints may help but can be cumbersome. Steroid injections can be given directly into the joint either in the clinic or under x-ray control. The benefits last several months but this benefit unfortunately will wear off. The risks of injection are small, but it very occasionally there may be some thinning or colour change in the skin at the site of injection. Surgery can be used to stiffen the joint (joint fusion) and whilst it will greatly improve the pain this needs to be balanced against the loss of movement. This can be particularly useful for the distal interphalangeal joint (the end joint of the finger). 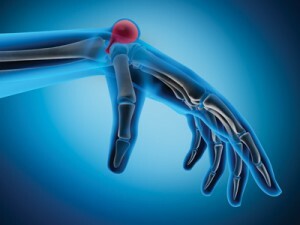 Arthritis affecting the basal joint of the thumb can be treated by removing the bone the thumb rests on – the trapezium (called a trapeziectomy) and sometimes a ligament reconstruction may be undertaken. If the arthritis is limited part of the trapezium can be removed and a disc placed at the base of the thumb (a pyrocarbon disc) and sometimes a joint replacement can give a better result whilst preserving greater grip strength. Removal of the whole trapezium is the most commonly performed operation, this does weaken the wrist but by removing the pain it significantly improves hand function. At the cause of arthritis rheumatoid arthritis is a common cause of joint problems in the hand however medical treatment has improved over the last two decades to the point where surgery is happily required less to treat this condition. 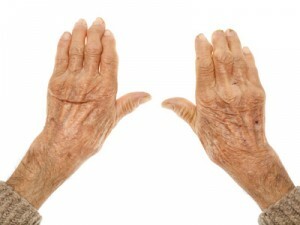 Other causes of arthritis in the hand include psoriasis or post injury degenerative changes in a single joint. Ganglions are the commonest type of lump in the hand. They contain a thick clear jelly which comes from the joint capsule or the synovium in the flexor tunnel in the hand. They occur commonly over the back of the wrist, on the front of the wrist at the base of the thumb, at the base of a finger in the palm, and on the back of the end joint of a finger. They are caused by degenerative changes in the joint capsule or an out-pouching of the tendon lining (synovial sheath) in the finger. Ganglions are sometimes, but not always, painful, they often vary in size. Ganglions are harmless and can safely be left alone and sometimes disappear on their own. If they are troublesome the contents of the cyst can be removed with a needle under local anaesthetic, this works best for those cysts on the palmar aspect of the fingers. The cyst can be removed surgically and depending on the location can be done under local or general anaesthetic. This is an injury to the ulnar collateral ligament of the metacarpophalangeal joint of the thumb. This ligament is one of the two strong supporting ligaments on each side of the base of the thumb. The ulnar collateral ligament supports the middle joint of the thumb when it is used for tight pinching. It is caused by a fall onto an outstretched thumb and is seen in skiers who fall whilst holding a ski pole. A more gradual stretching of the ligament can occur and this was given the name gamekeeper’s thumb. This was said to occur due to the repeated force of the thumb from the setting of traps but is now rare because of the scarcity of gamekeepers and more humane methods of pest control. The thumb is swollen and movement at the middle joint is painful. If the tear in the ligament is partial good results are obtained by splinting. Those where the tear is complete do better with surgical treatment. The difference between the two can usually be determined at examination, but can be painful and often a local anaesthetic is used in the examination. An x-ray is undertaken as there may be a small piece of bone pulled of with the ligament. With a partially torn ligament a splint or plaster cast is worn for six weeks followed by physiotherapy. If an operation is needed to repair the ligament this is undertaken under general anaesthetic or under a regional anaesthetic block. The ligament is reattached with a small metal device to fix it to the bone (a bone anchor) and movement of the thumb are begun from a few days after the operation in a protective splint. The results following treatment of this injury are generally good but on occasions further surgery to reconstruct the ligament or to undertake a fusion of the joint may be required. This is more likely where there has been a delay in treating the injury.